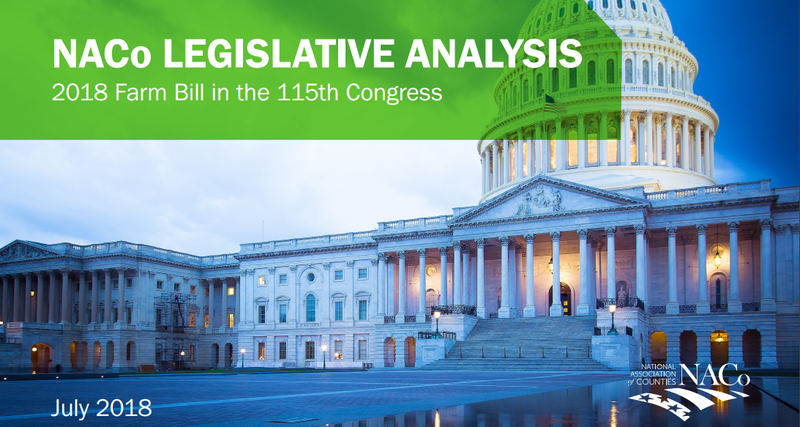 NACo releases comprehensive analysis of House/Senate versions of the 2018 Farm Bill as conference negotiations begin. Counties secured some key wins in the 2018 Farm Bill debate. Both chambers of Congress will now meet to negotiate a final package before current law expires September 30. After weeks of uncertainty, the U.S. House of Representatives passed the Agriculture and Nutrition Act of 2018 (H.R. 2), a five-year, $860 billion farm bill reauthorization package. The narrow party-line vote (213-211) was a result of unanimous opposition from Democrats over significant changes to the Supplemental Nutrition Assistance Program (SNAP). Strong opposition from House conservatives also held up the chamber’s approval of the bill, and ultimately forced House leadership to take up unrelated immigration reform bills before passing a farm bill that could be sent to the Senate for consideration. On Thursday, June 28, the Senate amended and replaced the House package, passing a revised $867 billion farm bill package on a definitively bipartisan basis (85-11). While the Senate bill generally maintains the structure of current law, the House bill makes significant changes to most farm bill provisions. Specifically, the House bill would eliminate certain conservation programs, including the Conservation Stewardship Program (CSP), and cut the conservation title by $800 million over the next ten years. Under the rural development title, the House bill would create new authorizations for the Secretary of Agriculture to address emerging rural health crises and forecast speed standards for rural broadband loans. The nutrition title of the farm bill, which includes SNAP and accounts for roughly 75 percent of overall spending within the package, is expected to be the biggest hurdle for Senate and House negotiators to overcome as they look to come to agreement on a final bill. While major reforms to SNAP work requirements and eligibility standards were key for attracting support from House conservatives, particularly the Freedom Caucus, the Senate farm bill does not include the work requirements for SNAP found in the House bill, nor does it include language found in the House bill that would restrict SNAP eligibility to individuals with incomes no more than 30 percent above the poverty level. The Senate bill does, however, include various measures aimed at reducing fraud within the program while expanding job training pilot programs. NACo helped draft bill text and amendments throughout both packages to preserve and promote key county priorities. Under the House bill, counties with regional jails would be able to exclude incarcerated populations for program eligibility under USDA’s definition of “rural.” Additionally, counties would be allowed to use USDA broadband loans and grants for middle-mile projects – currently prohibited under current law. In the Senate, NACo worked with Sens. Gillibrand (D-N.Y.), Cassidy (R-La.) and Tillis (R-N.C.) to create the Rural Innovation Stronger Economy (RISE) Grant Program, which would help counties strengthen the local economy through job accelerator partnerships with the private sector and institutions of higher education. Another major priority in the Senate package is a provision to reinstate the Undersecretary for Rural Development – a Senate-confirmed position tasked with overseeing a $216 billion portfolio – which was eliminated by President Trump and Secretary of Agriculture Sonny Perdue in 2017. Additionally, the Senate package also codifies an interagency “Council on Rural Community Innovation and Economic Development” to help leverage federal resources aimed at rural counties. Both chambers included language that would expand the Strategic Economic and Community Development Program – a major priority for counties – which incentivizes regional collaboration on rural economic development efforts. With the current farm bill set to expire September 30, 2018, the Senate and House must appoint a conference committee to negotiate a package that can be supported by both chambers. Once a final package has been written, both chambers must consider and pass the conferenced bill before expiration of current law. NACo will continue to monitor progress on the 2018 farm bill and will be deeply engaged with Congress and the administration to ensure the priorities of America’s counties are reflected in final legislation. A comprehensive analysis of both farm bills and their potential impact on counties can be found here.